The RP Photonics Buyer's Guide contains 30 suppliers for rare-earth-doped gain media. Ask RP Photonics on advice concerning the selection of rare-earth-doped gain media, or the design of lasers based on those media. Among the most popular solid-state gain media are the rare-earth-doped laser crystals and glasses; more recently, ceramic media have started to attract increasing interest. In any case, these media are doped with rare earth ions, which are nearly always trivalent (i.e. have a triple positive charge). Divalent rare earth ions have also been used in laser devices, but only in relatively exotic ones for cryogenic operation. In most cases, the rare earth ions replace other ions of similar size and same valence (charge state) in the host medium; for example, an Nd3+ ion in Nd:YAG (yttrium aluminum garnet) substitutes an yttrium (Y3+) ion. The concentration of laser-active rare earth dopants in the host medium is in most cases only a small molar percentage, although there are cases such as potassium ytterbium double tungstate (KYbW) where each unit cell contains a laser-active ion. A characteristic property of the trivalent rare earth ions is that their electronic transitions usually occur within the 4f shell, which is somewhat shielded from the host lattice by the optically passive outer electronic shells. (Ce3+ with its 5d–4f transitions is an exception.) This reduces the influence of the host lattice on the wavelengths, bandwidths and cross sections of the relevant optical transitions. Note that the rare earth elements include all the lanthanides except for the radioactive prometium, plus scandium and yttrium. All the laser-active rare earth ions are actually lanthanides. Therefore, lasers based on rare-earth-doped gain media are sometimes called lanthanide lasers. Table 1: Common laser-active rare earth ions and host media and important emission wavelengths. Technologically the most important are ytterbium- and neodymium-doped gain media for lasers and erbium-doped fibers for erbium-doped fiber amplifiers. Other rare-earth-doped ions are yttrium (Y3+), samarium (Sm3+), europium (Eu3+), gadolinium (Gd3+), terbium (Tb3+), dysprosium (Dy3+), and lutetium (Lu3+). These are normally not used for laser action but sometimes as a codopant, e.g. for quenching the population in certain energy levels by energy transfer processes, or for realizing saturable absorbers, or as optically passive constituents of laser crystals. There is a wide range of crystalline media (laser crystals) which can serve as host media for laser-active rare earth ions. Frequently used crystal materials are certain oxides (e.g. YAG), vanadates (YVO4, GdVO4), tungstates (KGW, KYW), fluorides (YLF, CaF), borates (BOYS), and apatites (S-FAP, SYS). The articles on gain media and laser crystals discuss a number of important properties of host crystals. 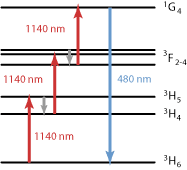 Compared with crystals, rare-earth-doped glasses usually allow for a larger gain bandwidth and thus larger wavelength tuning ranges, and also shorter ultrashort pulses with passive mode locking. Such glasses are used in the form of bulk pieces or optical fibers (e.g. rare-earth-doped silica fibers). The high optical confinement in fibers allows operation even on “difficult” laser transitions with low gain efficiency. Special fibers e.g. made on fluoride glass have particularly low phonon energies, leading to good mid-infrared transmission and long metastable level lifetimes. They are also often used for upconversion lasers. See also the articles on rare-earth-doped fibers, laser crystals versus glasses, and ceramic gain media. All rare-earth-doped gain media have in common that the pump and laser transitions are so-called weakly allowed transitions with fairly small oscillator strength. A consequence of this is that the upper-state lifetimes can be long, i.e. of the order of microseconds to milliseconds, so that substantial amounts of energy can be stored in such media. This property makes rare-earth-doped lasers suitable for pulse generation with Q switching, but also susceptible to spiking phenomena. In such respects, rare-earth-doped lasers are very different to, e.g., semiconductor lasers, dye lasers and gas lasers. Depending on the phonon energies of the host medium, some of the level lifetimes can be strongly quenched by multi-phonon transitions. Such effects are minimized in low-phonon-energy host media such as fluoride fibers. 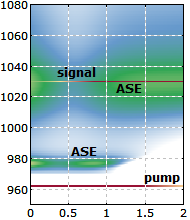 Quenching effects can be welcome if they depopulate the lower laser level, thus preventing or reducing reabsorption, or if they help to populate the upper laser level within the pumping process. Various kinds of interactions, in particular dipole–dipole interactions, allow energy transfer between different rare earth ions either of the same species or of different species. This is exploited e.g. in erbium–ytterbium-codoped fibers, where the pump radiation is dominantly absorbed by ytterbium ions and mostly transferred to erbium ions. EKSMA Optics offers rare-earth-doped laser crystals according to your specific requirements. Our ytterbium-doped double clad fibers offer the largest single-mode cores in the world enabling amplification to unprecedented power levels while keeping mode quality and stability. Packaged in an aeroGAIN gain module, the high performance of our fibers are easily accessible for building picosecond or femtosecond ultrafast fiber lasers.